Church of Jesus Christ of Latter-day Saints. Salt Lake Temple, IGI reference to Sealings for the dead, couples and children (includes some living spouses and children) 1943-1970; heir indexes, 1943-1965, Salt Lake City: Filmed by the Genealogical Society of Utah, (1959, 1975, 1980) , Film Number: 456547. Keith G. Harrison, The Ancestry of Nathan Lewis Harrison Revisited Nineteen Years Later, , at https://books.google.com/books?id=2bYaRLNfkk8C . Holt, Mich.: (2008) , p. 302. 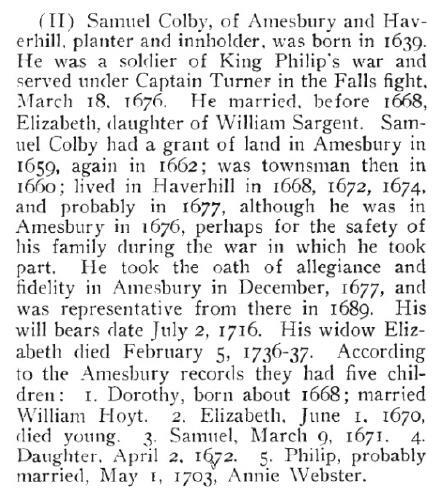 James Otis Lyford, History of the Town of Canterbury, New Hampshire, 1727-1912, Concord, N.H.: The Rumford Press, (1912) , Vol. 2, 300. Charles Sargent was born on January 31, 1673/74 in Amesbury, Massachusetts. 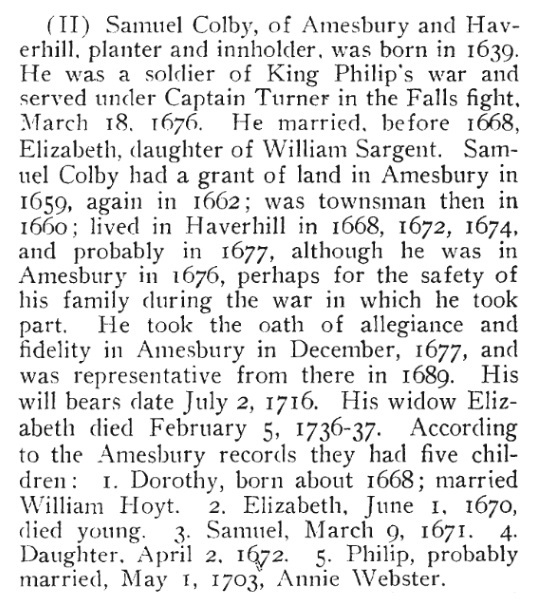 Charles died on August 6, 1737 in Amesbury, Massachusetts, at age 63. 1930 United States. Bureau of the Census. 15th census, United States, 1930 federal census : population schedules ; NARA microfilm publication T626, Washington, District of Columbia: Bureau of the Census Micro-Film Laboratory, ([19--?]) , Census Place: Boston, Suffolk, Massachusetts; Roll: 957; Page: 8A; Enumeration District: 504; Image: 87.0; FHL microfilm: 2340692. State population census schedules, 1915, Albany, New York: New York State Archives, , New York State Archives, Albany, New York, State Population Census Schedules, 1915; Census Place: Election District 01, Assembly District 04, Rochester Ward 14, Monroe, 29. 1920 United States. Bureau of the Census. 14th census, 1920 population census schedules, Washington, District of Columbia: The National Archives, ([193-?]) 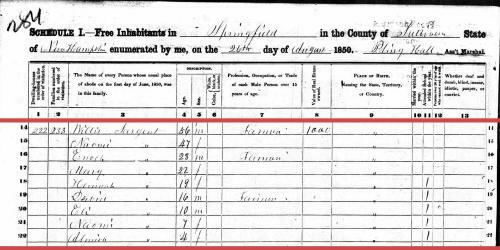 , Census Place: Boston Ward 22, Suffolk, Massachusetts; Roll: T625_739; Page: 16B; Enumeration District: 539; Image: 1282. Ancestry.com, U.S. City Directories, 1821-1989 (Beta), [database on-line]. Provo, UT, USA: Ancestry.com Operations, Inc., (2011) , Massachusetts > Boston > 1933 > Boston, Massachusetts, City Directory, 1933 > 1545. Massachusetts > Boston > 1936 > Boston, Massachusetts, City Directory, 1936 > 1818. Massachusetts > Boston > 1946 > Boston, Massachusetts, City Directory, 1946 > 1630. 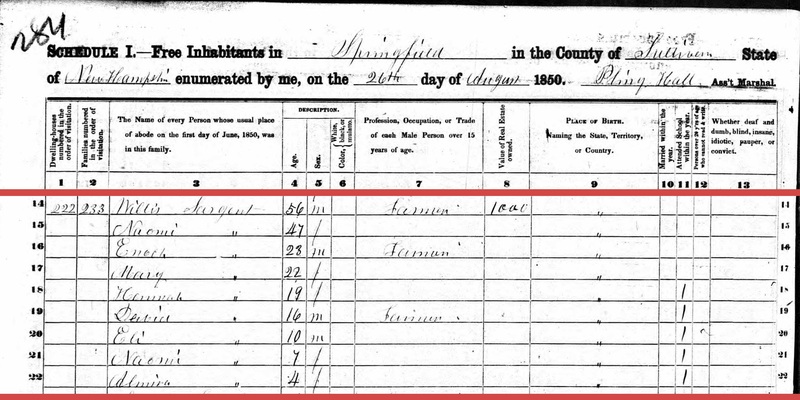 Sixteenth Census of the United States, 1940, Washington, D.C.: National Archives and Records Administration, (1940) , Census Place: Boston, Suffolk, Massachusetts; Roll: T627_1679; Page: 64B; Enumeration District: 15-676. Massachusetts > Boston > 1962 > Boston, Massachusetts, City Directory, 1962 > 1924. Massachusetts > Boston > 1966 > Boston, Massachusetts, City Directory, 1966 > 1823. Massachusetts > Boston > 1969 > Boston, Massachusetts, City Directory, 1969 > 1523. Vital records of Amesbury, Massachusetts to the end of the year 1849, , at https://archive.org/details/vitalrecordsofam00ames . Topsfield, Mass. : Topsfield Historical Society, (1913) , p. 468. Vital records of Amesbury, Massachusetts to the end of the year 1849, , at https://archive.org/details/vitalrecordsofam00ames . Topsfield, Mass. : Topsfield Historical Society, (1913) , p. 215. Vital records of Amesbury, Massachusetts to the end of the year 1849, , at https://archive.org/details/vitalrecordsofam00ames . Topsfield, Mass. : Topsfield Historical Society, (1913) , p. 221. Vital records of Amesbury, Massachusetts to the end of the year 1849, , at https://archive.org/details/vitalrecordsofam00ames . Topsfield, Mass. : Topsfield Historical Society, (1913) , p. 225. Vital records of Amesbury, Massachusetts to the end of the year 1849, , at https://archive.org/details/vitalrecordsofam00ames . Topsfield, Mass. : Topsfield Historical Society, (1913) , p. 226. Vital records of Amesbury, Massachusetts to the end of the year 1849, , at https://archive.org/details/vitalrecordsofam00ames . Topsfield, Mass. : Topsfield Historical Society, (1913) , p. 217. John S. Sargent and Aaron Sargent, Sargent Genealogy, , at https://books.google.com/books?id=jypPAAAAMAAJ . Somerville, Mass. : (1895) , p. 59. Elias Sargent was born on August 10, 1707. 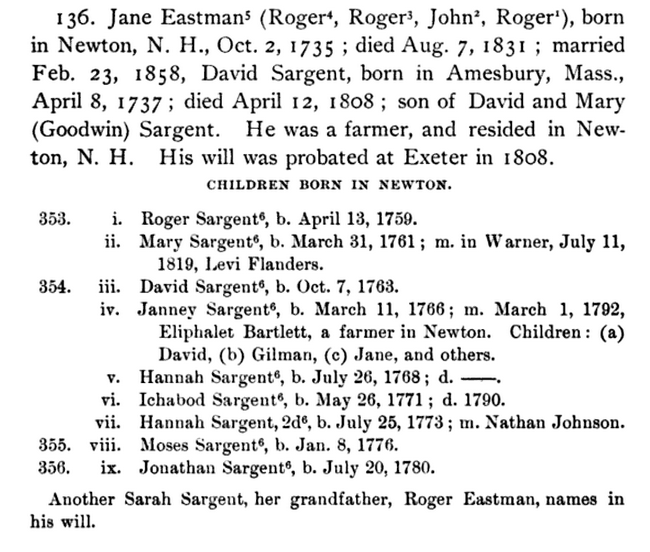 Edwin Everett Sargent, Sargent record : William Sargent of Ipswich, Newbury, Hampton, Salisbury and Amesbury, New England, U.S. : with his descendants and their intermarriages, and other Sargent branches, St. Johnsbury, Vt.: Caledonian Co., (1899) , p. 21. Vital records of Salisbury, Massachusetts, to the end of the year 1849, Topsfield, Mass. : Topsfield Historical Society, (1915) , p. 213. William Richard Cutter, Genealogical and personal memoirs relating to the families of Boston and eastern Massachusetts, New York: Lewis historical Pub. Co., (1908) , Vol. 1, p. 2053. Sandra Sutphin Olney, Passengers on the "Lion" From England to Boston, 1632, and five generations of their descendants,, , at https://books.google.com/books?id=l-NM0IyRpREC . Westminster, Maryland: Heritage Books, Inc., (2008) , Vol. 1, p. 381. 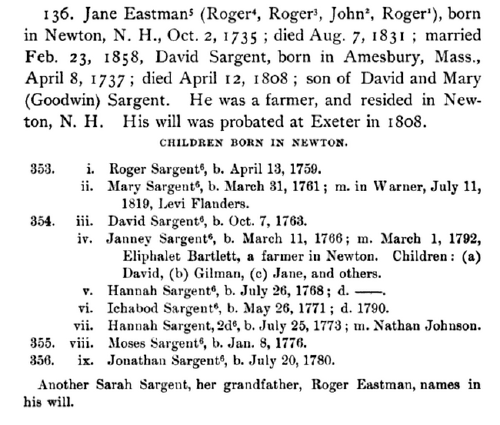 Elizabeth Sargent was born perhaps about 1794. Guy S. Rix, History and Genealogy of the Eastman Family in America, , at https://books.google.com/books?id=mNwRhOz28XgC . Concord, N.H.: (1901) , p. 253.